Sewer and drain clogs is one of the most common problems that home owners encounter. Instead of digging up your lawn or cutting open a wall or floor, we use the latest sewer line inspection camera to locate any clogs in your sewer. This helps us quickly diagnose the problem and determine the best course of action to fix the block. 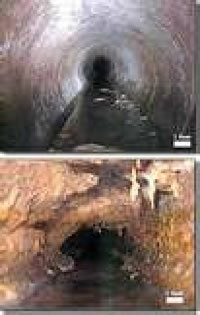 Broken or cracked pipes, due to settling, frozen ground etc. Blockage – Foreign object is prohibiting proper flow of the line. Corrosion – Pipe has broken, causing collapses in the line and restricting flow. Leaking joints – Allowing water to escape into the area surrounding the pipe. Root infiltration — Tree roots have invaded the main line, restricting normal flow or have damaged the line. Off-grade pipe — Existing pipes are constructed of substandard material that may have corroded. Diliberto can inspect your water or sewer main and clean and repair the clogged lines.